This post is a small milestone in that it is the first time I have devoted a Song Of The Day post to an artist that I have already given one to. Caro Emerald is really leaving a mark on my music psyche. The song, Absolutely Me, which is off her outstanding album “Deleted Scenes From The Cutting Room Floor”. Blues, Jazz, Hip-Hop, great song. Like it so much I put up the recorded version and a live version.. These songs are the ones that I will remember most from this year. It certainly appears that the world of music is beginning it’s move away from the pop artists that have been so prevalent and returning to the creation and production of some exceptional songs. About time I’d say. I attribute this to the web and the ability of many new artists to reach the public through such areas as Bandcamp, soundcloud, YouTube, Twitter etc. The advent of these devices has greatly expanded my musical horizons and will continue to do so. I have chosen not to do a finite top ten list as I appreciated all of these songs and at certain times would have been my number 1. In addition, I have chosen songs new to me this year, meaning they could be from anytime, although the majority are 2012. I hope you enjoy. I see great things from this Canadian singer-songwriter. Love this version, recorded live at CBC. This song reached and grabbed me by the ears and shook me to a musical high. Phenomenally written song, reaching one crescendo after another. Another tune that grabbed me. The more I listened, the more I liked. This song will be around for years, in movies, on TV, in commercials. Instant classic. Iceland’s contribution to music this year, and a great video as well. My favourite find of the year. I am really digging this act. Great voice, and different in a great way. That’s a start, still have some more to pass on and will do so tomorrow. Don’t want to destroy your attention span. 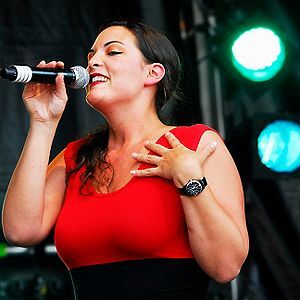 Song Of The Day – Caro Emerald – "Back It Up"
Kind of a fun song from the “Michael Jackson of The Netherlands”. Her most recent disc broke Micheal’s long standing record for biggest selling album (Thriller) in Holland.